In a large bowl, combine scallops, avocado oil, coriader, and 1 teaspoon salt. Let stand at room temperature for 1 hour. Preheat oven to 400 degree. Line a baking sheet with parchment peper. In a small bowl, combine chickpeas, olive oil, and remaining 1 teaspoon salt, stirring to combine. Place chickpeas on prepared baking sheet. Bake until chickpeas are crisp, 12 to 16 minutes. Spray grill rack with nonstick, non flammable cooking spray. Preheat grill to 400 to 450 degree. Grill lemon wedges until charred, 2 to 3 minutes per side. Grill scallops until nicely browned and nearly cooked through, 2 to 4 minutes per side. Slice into thin strips. Divide arugula among 8 salad plates. 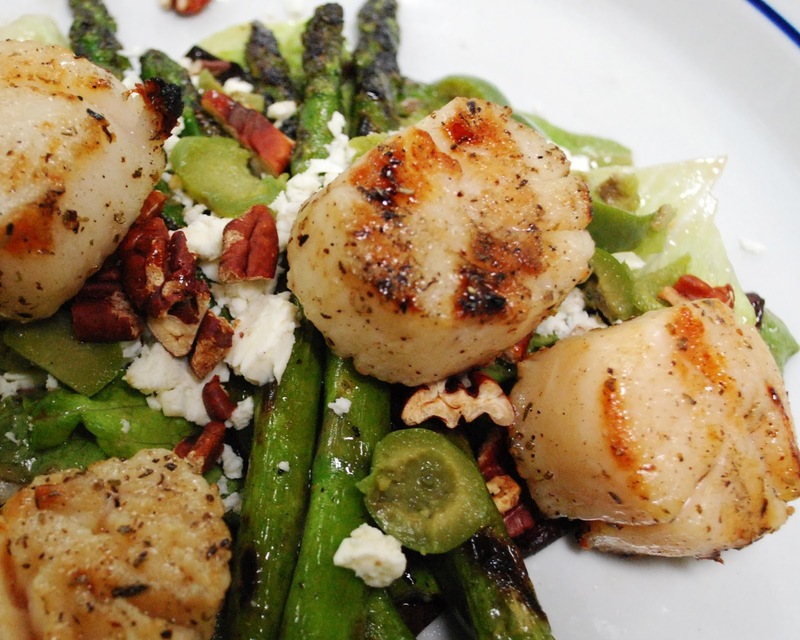 Arrange scallops, chickpeas, bell pepper, cucumber, and grilled lemon wedges on arugula. Drizzle with olive oil, and squeeze with grilled lemon wedges.